Join the 48-hour hackathon and create a Smart City app to make cities a better place to live in. 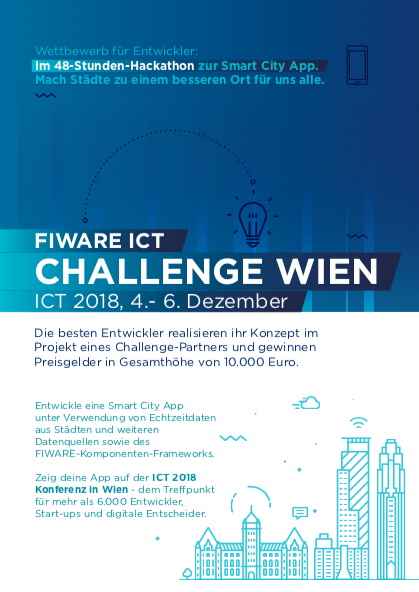 The FIWARE Foundation presents its FIWARE ICT Challenges 2018, a competition to develop smart city apps using real-time data from cities and other data sources, together with components of the FIWARE platform. The Foundation is joined by City of Vienna, a member of Open & Agile Smart Cities, the Linz Center of Mechatronics, the Vienna Business Agency, and Wien Energie in organising the challenges to develop solutions for smart cities. Find out all about the ICT Challenges and register by 30 November on the FIWARE website. For more information in German, download the brochure here.